One of Simon Pick’s unknown games exists in the form of Revolution, which can be found on Commodore Format’s Powerpack from issue 1. This game was actually meant for commercial release, and was showed around to various companies, but with no real response. The only company that showed interest was "Big Apple", and they wanted to change the game too much. After Simon had to get a job, the game was abandoned as he joined Sales Curve. It wasn’t until Commodore Format contacted Simon and asked him if he had any unreleased games for the covermount of the first issue, that he sold them Revolution for £2000. The big thing is that the game isn’t actually complete. There was to be far more added to the game, so technically its only a preview at heart, but released to Commodore Format as pretty much a full game. You wouldn’t have thought that it was a preview would you? The game features music by Martin Walker, and features a ship based in a kind of shield. 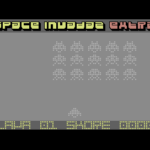 The screen rotates around the ship by pressing left and right, and enemies and rocks come hurtling towards your craft in the centre. You must rotate and shoot each object before it crashses into you. Along the way you can collect powerups to help you progress to the next stage. The game is very playable, and I thnk an original concept, based very loosly on Gyruss in its style. It’s a big shame that no-one took on this game, as Simon i’m sure would have finished it off a treat. Although this is all that remains of Revolution, it is still a great little game and a game which Simon says is one of his best. Read more on the game in "Creator Speaks", where Simon gives his own account on his masterful little game. Also check out the game instructions which were kindly put into a text file by James Monkman and can be found in the download. A great little revolution of a game… case closed. I'd finished my university course and before getting a "real" job I wanted to write one last game. I spent about 3-4 months writing Revolution on spec and sent it out to a load of publishers in an unfinished form. There was interest in the game but no-one was offering me the sort of money I was after - one publisher (The Big Apple, as I recall) said they were interested in the game but thought the whole spinning around thing was a bit odd & could I change it...! I was very rapidly getting broke, so started to look for a job - In no time I was offered a position at the Sales Curve, who at the time had no development staff, to set up their development side. I jumped at the opportunity and Revolution was abandoned. Some time later Commodore Format approached me and asked if I had any unpublished games that they could use as a cover mount - I gave them Revolution, which to this day remains unfinished, but playable - I think they stumped up £2,000 for it... and the rest is history."